Ropa vieja, a traditional Spanish dish is actually derived from another one - a Spanish bean stew. 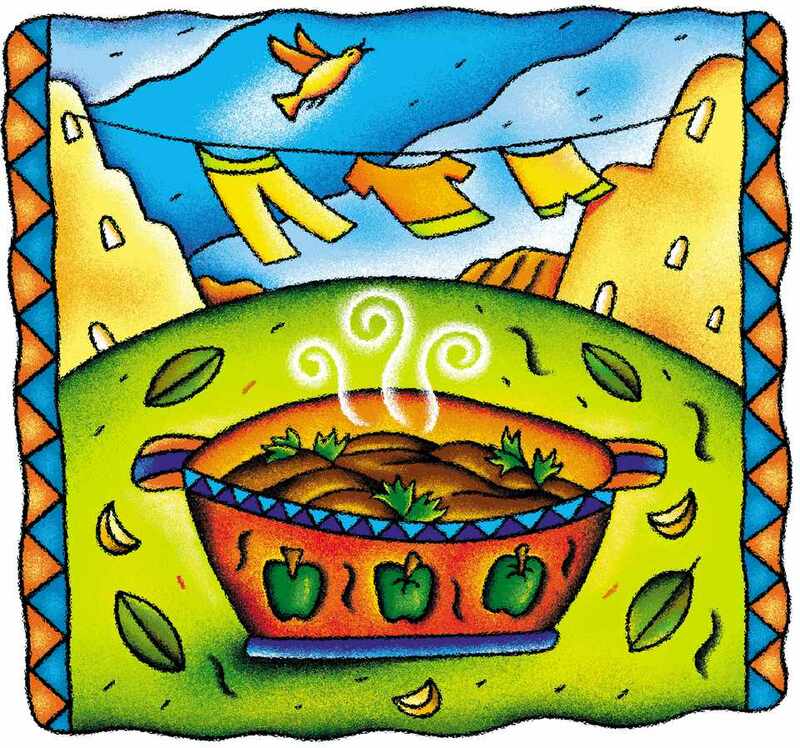 Preparation of ropa vieja was a way to take advantage of leftovers whenever a Spanish stew, called cocido or puchero was cooked. Although the standard of living in Spain no longer requires such thrifty ways, the dish is still popular. Families often prepare extra meat in their cocido, so that they may make ropa vieja the following day. Garbanzo beans were part of the daily diet in Spain until the last half of the 20th century and were considered a plain food for ordinary people. This version of ropa vieja uses canned garbanzo beans and a pressure cooker to reduce the cooking time of the meat. Because the time required for meat to become tender and fall apart differs from cooker to cooker, use the cooking time in the recipe as a guideline. If not using a pressure cooker for meat, cook in large pot and allow meat to simmer in for 90 minutes or more. Trim meat of excess fat and cut into 1.5-inch cubes. Peel and chop onion. Peel garlic cloves and cut in half. Pour olive oil into bottom of press cooker, then add meat, onion garlic and white wine. Secure lid and heat until pressure is built up and cooker is hissing, then reduce heat and keep the pressure steady for about 20 minutes. While meat is cooking finely chop onion, garlic and parsley and set aside. Remove from heat and place pot in the sink, and run cold water over the lid of the cooker until the pressure has been released. Carefully remove the lid and check the meat. Meat should flake apart with a fork. If further cooking is necessary, add a 1/2 cup to 1 cup of water, secure lid and cook another 5-10 minutes after pressure has built up again. When meat is finished cooking, transfer meat and any liquid to a dish, cover and set aside. Wash pressure cooker. Drain garbanzo beans and add to the pressure cooker with onion and garlic. Pour a half of the broth from the meat into the pressure cooker. If there is very little broth, and a bit of water. Secure lid and heat until pressure is built up and cooker is hissing, then reduce heat and keep the pressure steady for about 10 minutes. While garbanzos are in the pressure cooker, add olive oil to a large frying pan and sauté the onion and garlic until the onion is transparent. Remove from heat and place pot in the sink, and run cold water over the lid of the cooker until the pressure has been released. Carefully remove the lid and spoon the garbanzos into the frying pan. Continue cooking in the oil until skins begin to peel away from garbanzos and beans are very soft. To serve, place garbanzos in individual bowls and place meat next to them. Sprinkle parsley over top. Serve with fried eggs, fried green peppers and/or fried potatoes.